Alexandra Parade, Alfred Crescent, Alfred Street, Apperly Street, Austin Way, Bainbridge Place, Bakehouse Lane, Barkly Street, Batman Street, Bennett Street, Best Street, Birkenhead Street, Brennand Street, Brunswick Street, Bundara Street, Byrne Street, Church Street, Circle Place, Clauscen Street, Coleman Street, Delbridge Street, Eastham Street, Egremont Street, Falconer Street, Fergie Street, Freeman Street, Grant Street, Holden Court, Holden Street, Hopetoun Place, Howe Street, Ida Street, Ivan Street, Jamieson Street, King Street, Kneen Street, Laura Place, Liverpool Street, Mark Street, May Street, Mckean Street, McKillop Lane, Melville Street, Michael Street, Miller Street, Napier Street, Newry Street, Nicholson Street, Park Parade, Park Place, Park Street, Percy Street, Pilkington Street, Porter Street, Queen Street, Queens Parade, Rae Street, Railway Street, Reid Street, Rowe Street, Rushall Crescent, Scotchmer Street, Seacombe Street, St Georges Court, St Georges Road, Tait Street, Taplin Street, Taylor Street, Tranmere Street, Tucker Place, White Street, Woodhead Street, Woodside Street, York Street. The future suburb was bordered by a road to Heidelberg and the Plenty districts (later Queen's Parade) that ran diagonally to Hoddle's survey grid through the North Fitzroy's Crown reserve. It was proclaimed in 1850 as one of Melbourne's 3 chain (60 metre) government roads, now called 'Hoddle boulevards'. To the north, the township of Northcote on the Merri-Merri Creek (later Westgarth) was laid out by Hoddle in 1852 with some allotments extending south of the Merri Creek to Rushall Crescent in North Fitzroy. These allotments now have substantial buildings dating from the 1850s and 1860s (see Queen's Parade Heritage Area, HO 331). St. George's Rd was another diagonal route, on the western flank of the area, used to transport construction materials to the 1854-8 Yan Yean water supply scheme near Whittlesea. (77) By 1860, Fitzroy Council annexed the 480 acres now comprising North Fitzroy. Distinguished naturalist and engineer, Clement Hodgkinson, as Victorian Assistant-Commissioner of Crown Lands and Survey 1861-74, was responsible for the government subdivisions of Carlton (south of Princes St, 1860), North Carlton, North Fitzroy and Clifton Hill (1865-9), Hotham Hill (1866), South Parkville and North Parkville (1868-9). Under his supervision, suburban planning employed the cost-efficient grid system used by Hoddle. A model town design (78) in the area by Hodgkinson's predecessor. Andrew Clarke (the designer of St Vincent's Place, South Melbourne), is thought to have inspired the curved streets of Alfred and Rushall Crescents in North Fitzroy, although both streets were laid out under Hodgkinson (79). Lacking a public recreation reserve, the new Fitzroy Council was temporarily granted 7 acres in 1858 bounded by Reilly Street (Alexandra Parade),Queens Parade and Smith St. (80) The 1858 reserve was for a future Anglican parish church and the Collingwood (later the Metropolitan) Gas Company which commenced production in 1861. In 1862, Fitzroy Council requested an oval-shaped 50 acre public reserve flanking the Yan Yean tramway (St.George's Road). The oval reserve was laid out under Hodgkinson and extended south in 1863, as a squared-off addition to the reserve to the line of Freeman St, to provide the Prince of Wales Cricket Club an extra playing ground (81). In 1882-3, Edinburgh Gardens was permanently granted to the Council and planting of its avenues commenced. Sale of North Fitzroy's 1/4 - 1/2 acre allotments commenced in 1865, extending west from Rushall Crescent. 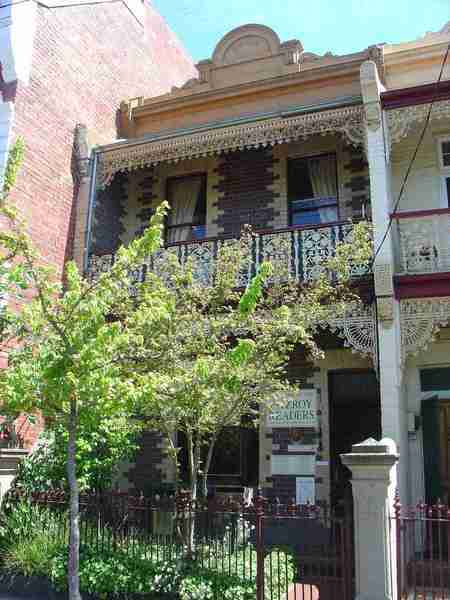 Further east, lots between Brunswick and Nicholson Street were sold between 1867 and 1875. (82) Settlement increased after 1869 when horse-drawn omnibuses began running from North Fitzroy along Nicholson St and Queen's Parade to the city. Development concentrated around the established quarry route (Nicholson Street) and the road to the Yan Yean Reservoir (St. George's Road). St. Brigid's Catholic Church in Nicholson Street was commenced in 1869 and the Methodist Church, further north, in 1874. In the pre-Boom years (before 1883) this was North Fitzroy's most established area, characterised by modestly scaled brick and wood houses, shops, hotels, and commercial premises, the latter prevailing on main routes such as Rae, Reid, Brunswick Sts and St Georges Rd. When cable tram routes along Queen's Parade, Nicholson Street and St. Georges Road commenced construction in 1883, North Fitzroy landowners began subdividing their allotments. On the Nicholson Street tram route, owners of the 1850s stone quarries and the 1839 farm allotments north of Holden St, followed suit. When tram services began in 1887 many new houses were ready for sale or under construction. North Fitzroy emerged as a late-Victorian commuter suburb with local shopping strips along the cable tram routes, the commercial strip of St Georges Road extending east and west along Scotchmer Street. Convenience shops were built on pedestrian street corners as households multiplied. The Inner Circle Railway running via Royal Park, North Carlton, Nicholson St, and Clifton Hill was completed in 1888 with a spur line dividing the Edinburgh Gardens into two, and terminating at the 'Fitzroy' station, Queen's Parade. A new rail link direct to the city (the Clifton Hill to Princes Bridge line) opened in 1901 (85) and saw Edwardian buildings filling out the suburban streets east of St. Georges Road and the revitalising of the main shopping strips. Public transport continued to support North Fitzroy as a commuter suburb during the 1920s with the opening of Rushall railway station and the electrification and extension of the St Georges Rd and Nicholson St tramways. North Fitzroy's suburban development, especially east of St George's Road to Rushall Crescent, was far from complete when the Boom collapsed in 1893. However its good access to public transport led to a rapid recovery. A number of small factories were built in or near the 19th century commercial strip of Scotchmer St, the best architectural examples being of the late 1930s. The main development period evident in the heritage overlay south of Holden St is that of the Victorian era with a substantial contribution from the Edwardian-period. There is also a contribution from some well-preserved inter-war buildings and individually significant places of all eras.
. Front gardens, originally bordered by timber or iron picket front fences of around 1m height; often set between brick or cemented pillars and curved brick garden wing walls.
. Public infrastructure, expressive of the Victorian and Edwardian-eras such as bluestone pitched road paving, crossings ,stone kerbs, and channels, and asphalt paved footpaths.
. For the range of Victorian and Edwardian-era building form and finish, from the modestly decorated timber cottages and stuccoed Italianate style houses, simply designed corner hotels and shops, to the rich variety of decorative buildings including an extraordinary concentration of decorative bichrome and polychrome brickwork and flamboyantly decorated Italianate residential and commercial terraces, banks and hotels, interspersed very occasionally with dominating narrow spire and tower elements of religious, commercial and institutional buildings.
. For the contribution of well-preserved inter-war buildings, particularly the small intact inter-war houses where the building design has adapted to the prevailing built character of the area in siting, scale, decorative quality and stylistic variety. North of Holden St, the 1839 farm allotments closest to Nicholson St were subdivided for row-housing during the late Victorian-era Boom years but remained empty until after 1900. Suburban development followed in the years to 1920 with timber villas on relatively wide (approximately 10 metre frontages). Some empty sites were developed in the 1930s and 1940s with medium density, duplex and estate housing development, some of these being architecturally distinctive. Mature street tree planting includes plane trees, typical of Edwardian-era and inter-war planting. The Merri State (now Primary) School 3110 and landscaping, in Miller St, is a key early non-residential building in this part of the Heritage Overlay Area. The main development period evident in the heritage overlay is that of the Edwardian-period with a contribution from the Victorian era. There is also a contribution from some well preserved inter-war buildings and individually significant places of all eras.
. Front gardens, originally bordered by timber picket front fences of around 1m height.
. Public infrastructure, expressive of the Victorian and Edwardian-eras such as bluestone pitched road paving, crossings, stone kerbs and channels, and asphalt paved footpaths. - The slow transformation into a completed residential suburb by WW2, with the last few vacant sites accommodating inter-war dwellings, some developed with medium-density housing, duplexes and flats.
. For the interwar medium density development pockets, including those contained within Pilkington St and parts of Barkly St, King and Miller Streets, significant for its intactness, form and high quality design.
. For important landscape and vistas, including the view of Merri Creek Bridge framed by palms and mature elms in the Merri Primary School reserve, and mature street plantings of plane trees. 84 Jacobs Lewis Vines, North Fitzroy Conservation Study, Fitzroy City Council, 1978: F.H.S, Chapter 2. and early MMBW survey Maps.